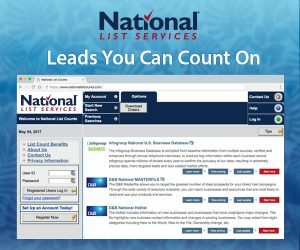 Bellevue, NE: National List Services (NLS), a division of First Direct, recently added a new National U.S. Business Database to its online search & delivery count system at http://www.NationalListCounts.com. The addition of this highly-anticipated B2B lead generation database is a continuation of NLS’s vision to seek and develop good relationships with leading compilers as to provide the most ethical and accurate lead data to marketers in a real-time, one-stop search and delivery online platform. Internal marketing teams and external agencies rely on accurate lead and prospect data for maximizing conversions and minimizing wasted spend. With omni-channel and right-time marketing quickly becoming the standards for high-performance campaigns, providing marketers with the right data is essential to their businesses and our industry. About National List Services: National List Services provides the most complete access to the nation’s leading compiled Saturation, Consumer, Business, Automotive, and Specialty List Segments. All made available on the most robust 24/7 count system found at http://www.nationallistcounts.com and supported by our experienced support team. Get the best list recommendations, the best service to solve today’s tough marketing challenges.